A must-see for sciart lovers, Brandon Ballengée’s installation Collapse is on display at the National Academy of Sciences in Washington, DC until March 20, 2015. Collapse was created in 2012 in response to the devastating effects on the marine food chain following the 2010 BP Deepwater Horizon oil spill. 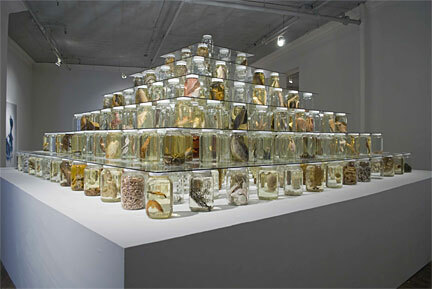 Simple, beautiful and devastating, the installation consists of a pyramid of gallon jars containing hundreds of preserved fish and other aquatic organisms. Empty containers – and there are many – represent species in decline or those already lost the extinction. A written appendix gives details on all the species represented in Collapse.